I've teamed up with Italian silicone-mold brand Silikomart, which you'll be hearing more about very soon. In the meanwhile I've kept myself busy by trying one of their chocolate silicone molds. I've never done chocolate molding before, but reading the product description it seemed easy enough... so I gave it a go! It was so easy! They were literally done within 15 minutes. All you need to do is melt chocolate (I prefer using a double-boiler, but can be done with a microwave as well), spoon it into the silicone mold and let it harden in the refrigerator. Et voilà! Done! 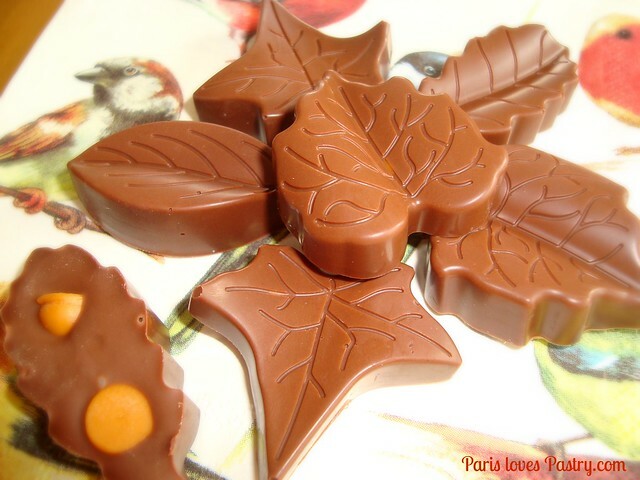 I made these incredibly beautiful Fall leaves. The precise details on them are gorgeous! I happen to spot more Silikomart chocolate-molds in a store today and I think I'm going to make some more Christmas-inspired chocolates for December. I'm dying for these gingerbread men & candy cane molds! Such a lovely, easy treat to give to family and friends, especially during the holidays (I've already gave away my chocolates, with rave reviews!!). Be sure to use a very high quality chocolate, such as Valhrona, Lindt or Côte D'or. I added butterscotch chips to make them a bit more unique. Does anyone have any other great tips on adding flavors to chocolate? 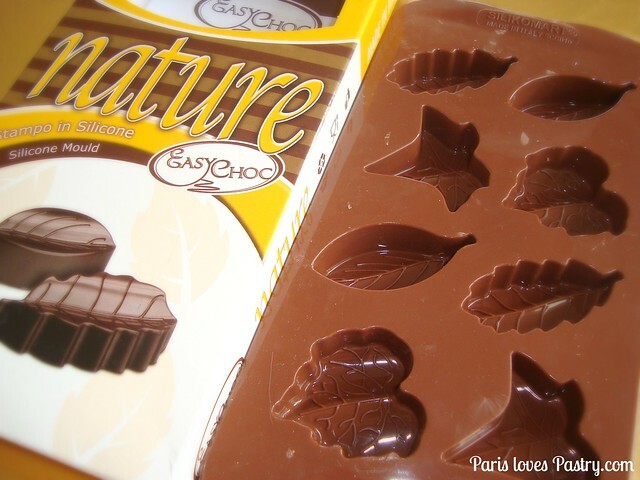 The 'nature' chocolate mold by Silikomart. Aww these are cute! I love anything that has a holiday theme to it. I'm pretty sure if I allowed myself I would get every knick-knacky item relating to holidays that's out there. 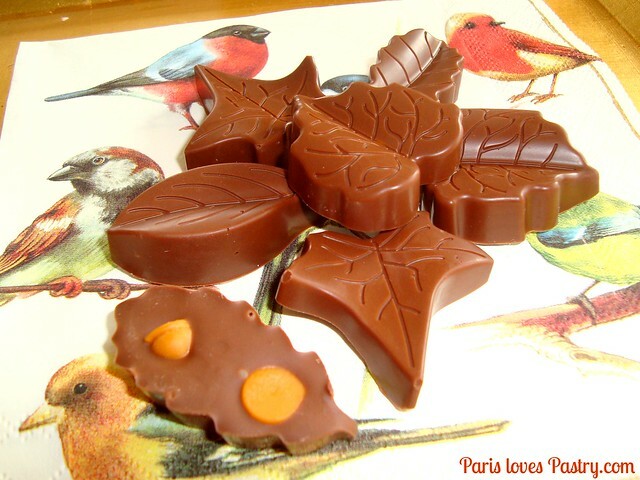 These are just perfect for autumn. I have the Mad About Macarons book - it's a beautiful book with gorgeous images not to mention amazing flavours of macarons. @Becca: Me too! I love Christmas shopping. @The baker: Thanks for the fondant tip! @Snooky doodle: Thank you :)! 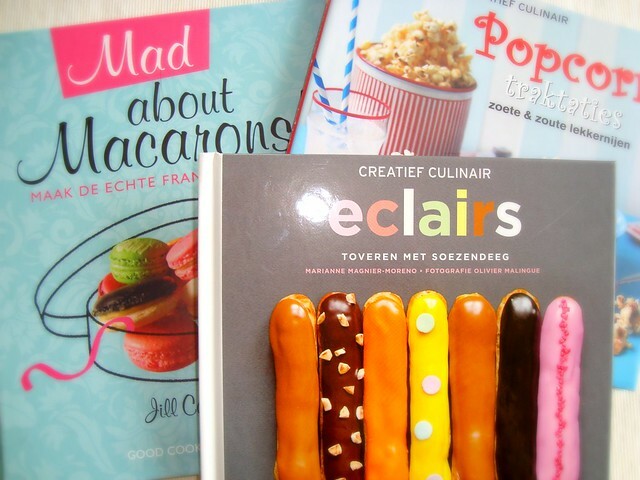 @miss b: Can't wait to start baking macarons from the book!